Traditionally, Hinduism is known as Sanatana Dharma, meaning eternal duty. 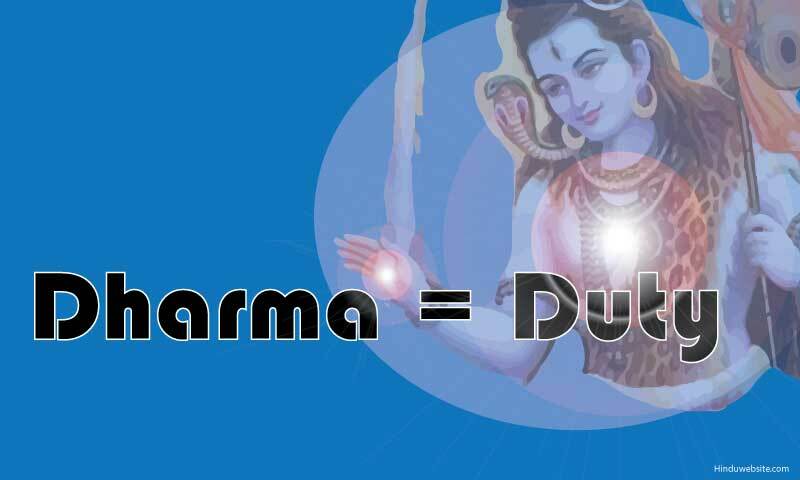 Many people do not really know what dharma means and why Hinduism is called Sanatana Dharma. Dharma actually means duty. Sanatana Dharma means the eternal duty of God. This Duty of God is shared, not just by Hindus, but by all beings in creation, including gods and the rest of the humanity. Dharma is also used in reference to any set of moral and religious laws and principles that govern religious duty and human conduct upon earth. Hence, in popular usage dharma is often interpreted as morality or religion rather than duty. The essential purpose of dharma is to protect the order and regularity of the world through specific obligatory duties (or actions) in which morality and religion are the means or the guiding factors. Every living being, and for that matter, every object in the diversity of God's creation, has a role and a specific duty in God's manifested universe, without which creation will be incomplete. Thus, Sanatana Dharma, which we popularly understand as Hinduism, is God's eternal duty shared by all from the highest to the lowest, hear and hereafter. Who is a Hindu and why we do not favor conversions? In truth, Hinduism is not just about those who practice it. Everyone who participates in creation and who shares a part of God's eternal and continuous duties and owes his or her life and allegiance to Him is a Hindu. If you are living selflessly and performing your actions selflessly, you are a Hindu. If you are helping others, you are a Hindu. If you are living for God, in the service of God and offering your actions, you are Hindu. If you participate in any manner in God's eternal sacrifice called creation, you are a Hindu. This is the secret not many people know. It is why we do not actively go out seeking followers and conversions. We believe that knowingly or unknowingly, willingly or unwillingly, everyone is part of God eternal Duties and therefore do not require to be converted. However, wise people may tell others that since their duties come from God, they should not claim ownership of such actions or live selfishly. Our religious scriptures are not meant to convert people but to remind them of the need to live dutifully and responsibly and avoid karma that arises from selfish actions. In Hindu conception of the world, there are only two religions. The religion of the good (daiva) and the religion of the evil (asura). Living selflessly in the service of others is godly. Living selfishly for oneself is evil. In the following discussion we will elaborate upon this concept. There is a popular saying in Sanskrit, 'dharmo rakshita rakshatah,' which means if you protect your religion or dharma, your dharma will protect you. Now what do we mean by the word dharma? Actually, there is no equivalent to the word dharma either in English or in any other language. In our tradition, the word has many meanings and many connotations. But at the most basic level, dharma means your natural activity or propensity. For example, in case of an animal like the dog, its dharma, among other things, is to eat and procreate, to be friendly with human beings, and to bark and bite if it is subjected to intense fear or agitation. The dharma of a snake is to crawl, live in dark places, to store poison in its teeth, and bite its prey or anyone who tries to harm it. As far as the animals are concerned, their dharma is to fulfill their respective roles in creation, living according to their natural instincts, serving as food to other animals and surviving against threats and harsh nature. Since they lack intelligence, their roles are performed mostly by Nature. The dharma of gods or divinities is to help people and other living beings and assist God in enforcing His laws, protecting people from evil and maintaining righteousness in the world. When it comes to human beings, we know that we are not mere animals, although some people prefer to live that way. We are rational beings who are endowed with reasoning power, which we call buddhi or discriminating intelligence. We are also endowed with intelligent self-awareness and the ability to direct our will in whatever way we deem fit. So in case of human beings, dharma means to live according to their highest nature, controlling their lower nature, animal instincts, natural urges and baser desires. The duty of human beings is to live intelligently, help the beings of lesser intelligence, and nourish those who depend upon them. They are also expected to serve the purpose of creation, do their part in maintaining the order and regularity of the world and society. A devout Hindu is expected to perform five obligatory duties: nourishing gods, nourishing ancestors, nourishing needy human beings, nourishing other living beings and serving the seers and brahmanas. These are called obligatory duties because their practice leads to harmony, peace, order and regularity. If you analyze carefully, you will realize that all religions aims to accomplish this only: enforce discipline among humans and make them to look to the heavens and God to manifest good in their lives. In their own ways, they teach that we should live with a certain sense of moral and spiritual responsibility, curbing our baser instincts and controlling our evil and immoral thoughts. The language and expression many be different but the essential philosophy is the same. Hence in ancient India, spiritual teachings that were aimed to regulate and define ideal human life, conduct, and obligatory duties were equated with dharma. Following the same tradition, the Jains called their faith Jain Dharma and the Buddhists also called the teachings of the Buddha as Dharma or crudely, Dhamma. We do not have to argue which Dharma is the best. Every dharma has its own value, just as every duty. All duties flow from God and all dharmas also flow from Him only. Each caters to certain needs and fulfills certain aims. Every living being who lives upon earth is an embodiment of God's eternal duty. Therefore, we have to be careful when we speak ill of others or degrade their faith. Agreed that not all duties are equal, but all duties are sacred since they flow from God. However, if we perform actions selfishly for our own end, then we are not performing God's duties anymore and we become subject to their consequences (karma). Since the actions of animals are guided mostly by Nature, they do not incur karma as much human beings who are intelligent and who can exercise their will for good or bad. Now what is the higher nature or the true dharma of a human being? According to Hinduism, as a human being, you have a responsibility or a duty towards yourself, towards your family, towards your society, towards your ancestors, towards your divinities and towards all living beings in general. These duties are essentially meant to establish peace and stability within yourself, in others and in the world in general. God is the upholder of dharma and the order of the universe. He makes sure that the fire burns, the wind blows and the water flows because these are their essential dharmas. In case of living beings, He enforces the law of karma and allows them to indulge in willful actins out of their desires and natural instincts. However, if the worlds becomes too chaotic or disturbingly disorderly, on account of their activities, He incarnates upon earth and sets things right. Our dharma also depends upon our births, the circumstances in which we live and the profession we choose to follow. It is better if you choose your profession according to your natural inclination, or what you love most. But if you are unable to do that, whatever may be the profession you choose, you should do it with sincerity, discipline and dedication, as an offering to God, because although we may think ourselves to be independent individuals, we are part of the universe and our actions have a bearing upon others and the world in general. Whatever may be the religion or the personal philosophy you follow, make sure that you contribute to peace and harmony and do not disturb yourself or others in harmful and evil ways. According to the Bhagavadgita, a true yogi does not disturb others nor is disturbed by them. He does not create any ripples in the lives of other people or beings. He lives peacefully, without imposing himself or trying to control others. He is at peace with everyone. That is the true purpose of yoga. If you are for peace, harmony and order and if you strive to establish them and maintain them in your life and your environment, it is deemed that you are following your dharma and you are in tune with your spiritual nature. God and all the divinities whom we worship will be happy with you and respond to you promptly whenever you pray to them sincerely. It is through your adherence to dharma that you become a true devotee of God and fulfill the central purpose of your life. Here are a few simple ways in which you can practice your essential dharma. Curb your baser desires and your animal instincts. Refuse to be guided by your lower instincts. Identify yourself with your inner self, knowing that you are neither your body nor your mind but the immortal self, who is caught in the whirlpool of life. Offer whatever you have and whatever you do to God or the divinities whom you love most. Make your life and your activities an offering to God. Practice detachment so that emotionally you will be more stable and peaceful. Cultivate sattva or purity by practicing virtue and avoiding wrong doings so that you can experience affinity with your spiritual side. Practice non-violence and compassion towards other living beings. It will set you apart from animals and provide you with an opportunity to practice universal friendliness (mitrata). Avoid thinking and harboring evil and immoral thoughts. Practice yoga and meditation so that you can control the modifications of your mind and experience peace and harmony within yourself. Worship your gods and divinities so that they will be active in your consciousness as well as in the cosmos and express themselves through you. Do your duty, whatever it is, without expectation and with a sense of sacrifice. Fill your mind with positive and spiritual thoughts. Speak right words, think right thoughts and do right deeds. It is the dharma of the animals to live for themselves as intended by Nature. It is the dharma of humans to live wisely and intelligently and work for their liberation as intended by the Creator. The dharma of gods is to exist for others and help them according to their merit. As far as we are concerned, we have a choice. We have the freedom to live like animals or live like gods and accept the consequences. We have a choice to live in whatever way we want, provided we are willing to pay the price. We can live for ourselves, living selfishly, fulfilling our material desires, which is what most people do, or live for others, to the extent we can, living according to our spiritual aspirations and expressing the divinity that exists within each of us. We can live as if this is the only life we have or live with the awareness that our current life is a preparation for the next life or afterlife. We have the freedom to live the right way or the wrong way or move towards darkness or light. This is an unique opportunity given to human beings. Hence it is said that even gods, if they want to progress to still higher planes, have to be born upon earth as human beings and practice dharma to qualify for their further advancement.